Las Vegas, April 11, 2018 – Interlogix, a global leader in security and life safety solutions, is now offering homeowners an advanced video doorbell camera with new customizable camera features as part of the award-winning UltraSync system, all of which will be displayed and demonstrated April 11-13 at the International Security Conference & Exposition (ISC West) in Las Vegas (booth #18019). Interlogix is part of UTC Climate, Controls & Security, a unit of United Technologies Corp. (NYSE:UTX). The UltraSync system provides voice-controlled home automation and professional-grade, UL-listed security features to keep homeowners in touch and in control of a growing number of home devices including compatible lights, thermostats, locks and other appliances. The video doorbell camera lets homeowners know who’s at their door. The UltraSync mobile app offers visibility and two-way conversations with visitors through a smartphone or tablet. Motion sensors provide instant alerts when people move across user-customized boundaries within the camera’s 180-degree field of view. The camera also provides sharp high-definition images and automatic night vision; it also starts recording to an embedded 16GB SD card on motion or when someone rings the bell. “The UltraSync doorbell camera brings a higher level of control, security and convenience to any home,” said Michael Chiavacci, general manager, Interlogix, North America. “Homeowners can easily interact with visitors, watch packages being delivered and even dismiss unwanted solicitors using their UltraSync mobile app,” said Chiavacci. Interlogix also added more camera control options in the UltraSync 4.1 system update. Homeowners can toggle between high- and standard-definition video to control frame rates and the amount of video recorded. A ‘record now’ button immediately begins recording video and/or audio. Camera notifications can be set to include video up to 30 seconds prior to and 60 seconds after an event. Many other features, such as notifications sent to mobile devices, doorbell chime over the UltraSync Hub and video recording, can be enabled or disabled. An updated camera wizard makes installation easier and more convenient. 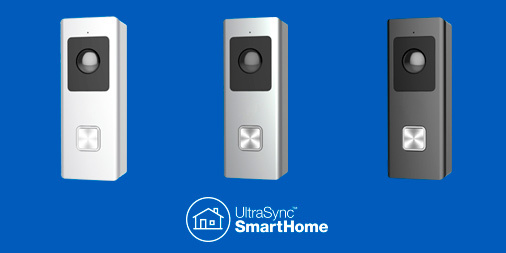 “The video doorbell camera, combined with our recent addition of voice control of the system via Amazon’s Alexa-enabled Echo® devices, make UltraSync one of the most convenient home security and automation system available,” Chiavacci said. Interlogix dealers can begin uploading the online update to UltraSync users beginning in late April. The doorbell camera will be available in early May.